Community involvement is important to us because our students, families and staff are integral to the development and growth of each child who attends our school. GAMES , MUSIC with MS. LISA SILVER, FRESH LATKES, DOUGHNUT DECORATING, & MORE! Micah Children's Academy and Congregation Micah are hosting their 2nd Annual Scholastic Book Fair just in time for the holidays! Join us to get all of your gifts and supplement your child's library all while donating to MCA and the Micah Religious School! Join us for our annual Costume Tot Shabbat here at MCA! 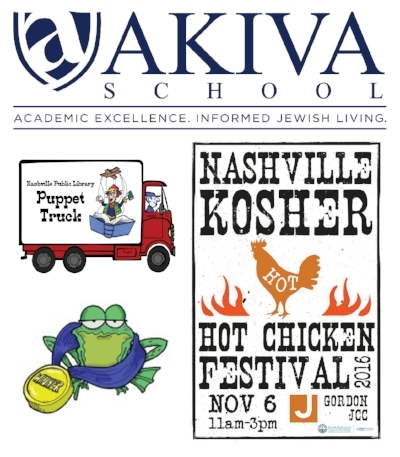 Akiva School is hosting the Nashville Public Library Puppet Truck as they perform The Celebrated Jumping Frog of Calaveras County at 10:30AM followed by the Nashville Kosher Hot Chicken Festival at 11AM! The Nashville Public Library Puppet Truck brings Aesop's Fables to MCA! Micah Children's Academy and Congregation Micah are hosting a Scholastic Book Fair just in time for the holidays!